Feisty Pets are a series of stuffed plush animals from William Mark, that turn from adorable to terrifying and scary if you squeeze them. Feisty Pets are the latest line of fun and innovative toys from the creative minds at William Mark corporation - the creators of Air Swimmers! 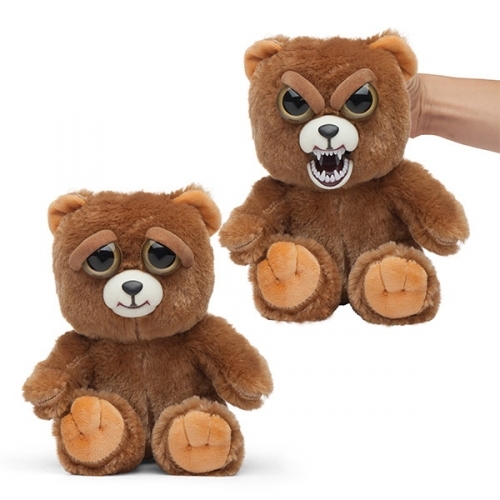 Feisty pets are a line of plush animals with "stuffed attitude"! Each pet changes expression from cute to 'feisty' when you gently squeeze it behind the ears. No batteries or extras necessary. Captivate and entertain any audience, young or old with these unique and animated animals! They're great to cuddle and play with, but are also perfect for a hilarious and innocent prank on friends and family! Collect each charismatic character - dog, cat, monkey and bear.